Engine has a transferrable 5-year warranty good until 6/22/2022. From the warranty brochure "the Extended Coverage program gives you the same full coverage as the two first years of warranty. It covers repair and replacement of defective parts. This includes all Volvo Penta branded products, excluding consumables such as filters, hoses and belts.". Cruising speed above is the seller's "fast cruise" -- at "slow cruise" of 8 knots he reports that fuel consumption is 2 gph. Mase 2.7 kw generator in sound enclosure, with only 5 hours. Airdraft of 8'8" is with mast down. Airdraft with mast up is 12'. Bridge clearance on trailer is 11'8". Boarding is from the swim platform with safety handrails (staples). The propane locker is safely mounted to the swim platform. Enter the cockpit through the transom door. The cockpit is very large, and contains integral seating and storage compartments, and is covered with a canvas bimini top. The interior is accessed via a full-length glass cabin door. The head/shower compartment is immediately to starboard, and the guest cabin (with a small convertible desk) is to port. The salon settee with many folding / convertible features provide great flexibility for a variety of purposes including sitting, eating, drinking, socializing, sleeping, co-piloting and navigating. The galley has a propane range, good countertop space, optional teak storage organizer, a Nova Kool fridge/freezer, and a microwave oven. The helm is well-equipped with good all-round visibility. The master berth with its filler cushions also enables a variety of configurations. Cabin heat and air conditioning is provided by a Webasto FCF 12k BTU reverse-cycle system. Weaver snap davits installed on swim platform for dinghy. Handheld remote control for bow and stern thrusters. Garmin 7612 xsv chartplotter; 4 kw Garmin xHD radar; Garmin autopilot with handheld remote. Fusion MS-UD750 stereo. Majestic TV on drop-down pivot mount. 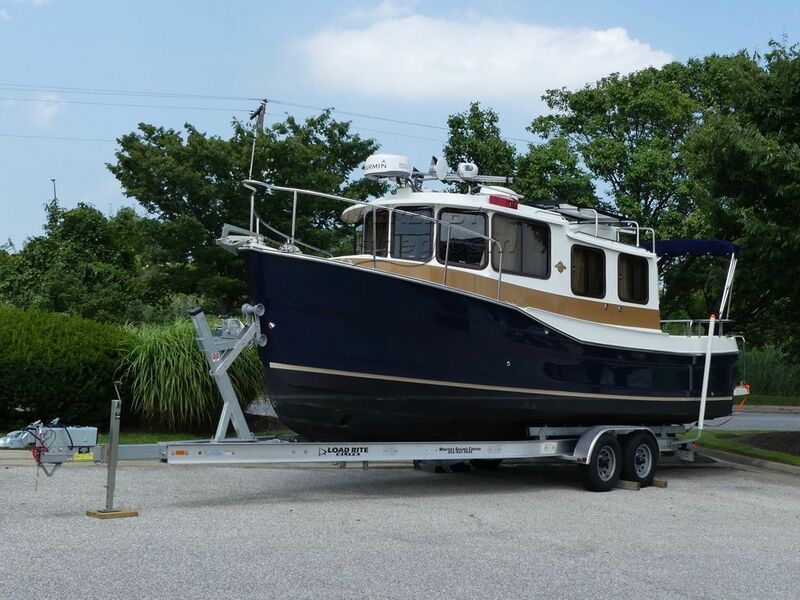 This Ranger Tugs R-27 is an opportunity for people who prefer the size, features, and conveniences of the R-27 model, and want a like-new boat, but are not interested in the gasoline outboard propulsion of the current model R-27. This nearly-new example, with less than 160 hours on its Volvo-Penta D3-200 diesel, is in exceptional condition and well-equipped. In addition to a long list of standard features this boat Includes: Load Rite Elite trailer; Mase diesel generator; reverse-cycle heat/air; cockpit bimini canvas; Weaver dinghy snap davits; propane FORCE 10 range; transferrable engine warranty until June 2022. Standard features include solar panels, underwater lights, bow and stern thrusters, trim tabs, and much more. This boat fits a lot into a compact package and is about the sweetest-looking thing on the water. Clean and ready to tow away! FLIR camera included incidentally in some photos is excluded from the sale. This Ranger Tugs R-27 Volvo-Penta D3-200 Diesel has been personally photographed and viewed by Paul Burbach / Scott Helker of Boatshed Seattle. Click here for contact details.